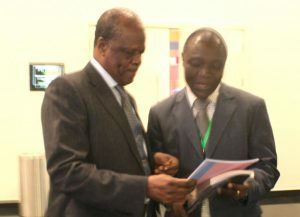 Henri Djombo, Congo’s Minister of State, recently appealed for an increase in efforts to rejuvenate Africa’s agricultural practices and called on every stakeholder in managing the Congo Basin Forest to work assiduously to improve agricultural production and activities in non-forest land on the continent. Congo’s agricultural and forest sectors need to be managed in a sustainable manner while responding to climate change,” Djombo said. 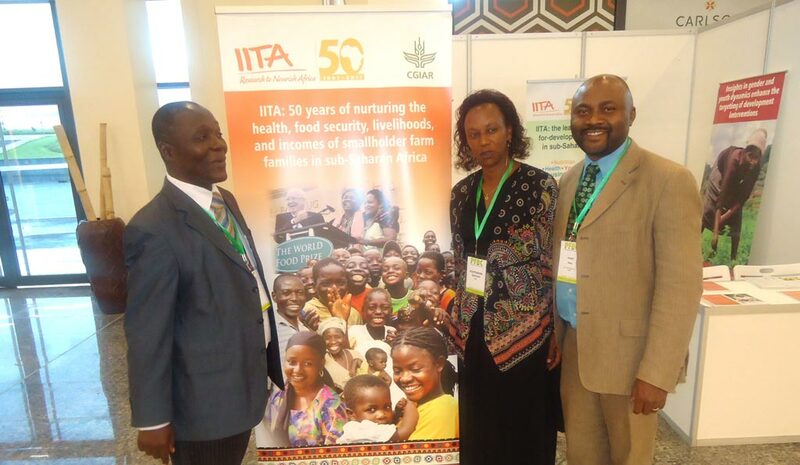 Denis Sonwa of IITA & CIFOR (Left), and Kantengwa Speciose IITA Rwanda (center), with a visitor at the IITA exhibition booth during the event at Kigali. The call follows the focus of the 16th Meeting of Parties (MoP) which enjoins members of the Congo Basin Forest Partnership (CBFP) to help Central African countries in their efforts to transform agriculture into opportunities to fight climate change, feed populations, provide job opportunities for youth, and ensure a balanced development of agribusiness models. At a symposium jointly organized by IITA and the Center for International Forestry Research (CIFOR) in Kigali on 21-26 November 2016 to commemorate the 16th (MOP) of the CBFP, thematic areas that could help the region reach its agricultural potentials were discussed. These included mitigation and adaptation to climate change, conservation and sustainable use of wildlife resources, as well as the interface between agriculture and the forest in the Congo Basin. Denis hands IITA annual report to the Minister. Denis Sonwa from CIFOR and IITA highlighted IITA’s role in mainstreaming improved agricultural materials and technologies / practices in protected areas and landscapes of Cameroon and DR Congo. Research institutions were challenged to develop planting materials and technological packages compatible with the protection of forest stands in Central Africa. Other delegates that attended and spoke at the session/symposium coorganized by IITA and CIFOR on climate change and agriculture were from the Rain Forest Alliance, the International Union for Conservation of Nature (IUCN), and the Government of DRC. Jostein Lindland of the Government of Norway chaired the session organized by CIFOR and IITA. IITA is a member of CBFP. It was launched by the then Secretary of State Colin Powell at the 2002 World Summit on Sustainable Development in Johannesburg during the Rio + 10 summit. The CBFP1 works with the Central African Forests Commission (COMIFAC) to promote conservation and sustainable management of the Congo Basin’s forest ecosystems. It is now facilitated by the European Union (EU) and brings together around 70 partners from government, donors, international organizations, NGOs, scientific institutions, and the private sector. CBFP offers IITA an opportunity to share its vision of natural resources management in sub-Saharan Africa and particularly its effort to intensify agriculture in the perspective of food security, job procurement, and sustainable natural resources management.